Ube halaya or ube jam is one of the best Filipino dessert. You can add this into you halo – halo or simply spread it onto your bread. It is also great with your milkshake. There are different versions of ube halaya. The most memorable for me is the fish – shaped chewy ube halaya version. I used to see this ube halaya in our town fiestas. I think some of you can relate with me, right? However, no one will argue with me that the best ube halaya is the most famous Good Shepherds Ube Halaya. Their jared ube halaya is so smooth and creamy. I simply scoop a spoonful of it and go straight into my mouth and it was such a bliss and sinful. I know you have done it also, right? You must prepare your arms when you want to make this dish. It requires lots of stirring and patience to achieve that thick consistency. If you want to achieve a smooth texture, I highly recommend to use a meat grinder. There will be lots of ube bits in your final dish if you simply mashed the ube. I haven’t tried it but maybe you can boil the ube longer until the ube turned mushy and easy to mashed. Others will suggest that you boil the ube with the skin on. Then, peel the skin off using your finger when it is already cooked. 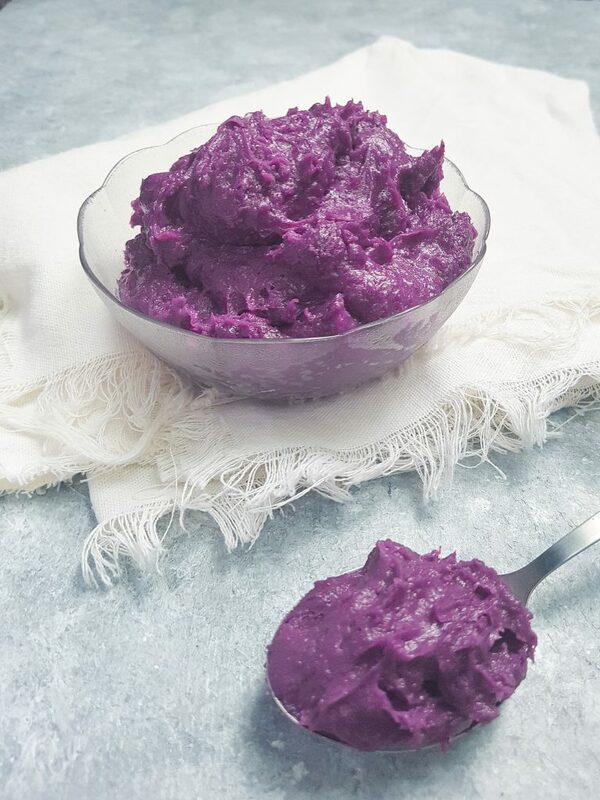 According to some, the deep color of the ube is stored in its skin. You can try this method, however, what I did was I peeled the ube and boiled it until fork tender. By then, the boiled liquid has this deep ube color. I took out the ube and reserved the ube syrup or the boiled liquid and add it into the milk mixture. Do not use too much water when boiling the ube. It really cooks fast and does not need so much water. For this recipe, I added a cup of cream cheese. This is totally unnecessary, however, I just want to add extra creaminess to this dish. Did I achieved that smooth texture? Nope! However, I managed to reduced the bits of ube by using a stick blender. When everything is combine, simply use the stick blender and pulse it for few seconds. Clean and peel the ube. Slice into manageable size. Combine sliced ube and water. Boil for 30 minutes or until the ube is tender. Remove the ube and save the boiled liquid. Mashed the ube. Alternatively, you can use a meat grinder to ensure smooth consistency. Combine the boiled liquid, evaporated milk, cream cheese, sugar and salt. Mix until you have a smooth consistency. Add the ube into the milk mixture. Heat the mixture to medium heat with continuous stirring. When the mixture is hot enough, add the butter and continuously stir until you achieve a very thick consistency, roughly 40 minutes. 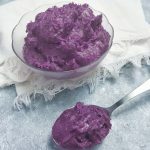 Ube Halaya or Ube Jam is one of the best Filipino dessert. You can add it into your halo – halo or spread it onto your bread. You can even add it into your milkshake. Place the milk mixture in a wok or in a non – stick pan.